The government of Ethiopia could easily be engulfed on a major scale by ethnic and religious turmoil just like Sudan. Or radical Sunni Islamic zealots in Somalia could be causing mayhem by exporting their brand of “hatred” to fellow Muslims in Ethiopia. However, Ethiopia, despite being multi-ethnic and multi-religious, continues to thrive under the leadership of the Ethiopian People’s Revolutionary Democratic Front (EPRDF). The EPRDF under the Prime Minister of Ethiopia, Meles Zenawi, have managed to galvanize a desperate situation because modern day Ethiopia is developing rapidly. The reason for this development is because the EPRDF have put great emphasis on modernization and stability. This can be seen by the expanding education sector and the continuing growth of new universities and the same applies to developing the road system and infrastructure of Ethiopia. The legacy of the Mengistu regime which collapsed in 1991 was deplorable and the EPRDF had to virtually start from scratch. This applies to the democratization of Ethiopia, modernization, and creating a system which benefited the people of Ethiopia. While Ethiopia started on a path of democratization and modernization many neighboring nations remained in chaos. This applies to the ongoing crisis in both Somalia and Sudan. Meanwhile, Eritrea is hardly developing on the right path; on the contrary, this nation is alienating itself because of its role in Somalia and other dubious foreign policy ventures. If we turn the clock back, it is apparent that many centralized nations which were communist, multi-ethnic, and multi-religious, failed to survive the political environment of the 1990s. This notably applies to the former Soviet Union and Yugoslavia; meanwhile, it must be remembered that minorities in China are massively outnumbered by the majority ethnic Han. Added to this, is the hostile environment because millions have been killed since the 1990s in the Democratic Republic of Congo, Rwanda, Somalia, Sudan, and other nations. Despite this, the EPRDF is open to all ethnic and religious groups and this political party clearly understands the need to respect all ethnic and religious groups in Ethiopia. Therefore, ethnic and religious tensions have been contained because of the role of the ruling party and the ongoing democratization of Ethiopia. Of course, the 1990s and early 21st century for Ethiopia have not been easy. This applies to the war with Eritrea and ethnic and religious tensions which sometimes become ignited because of various factors. Also, the threat from Somalia is real because Sunni Islamists threaten to destabilize Ethiopia and allow global jihadists to spread both internal and global terrorism. Also, the infrastructure was very weak under Mengistu and at the same time the population continues to grow rapidly. Despite this, the EPRDF is clearly focused on creating a sustainable economy and expanding opportunities for all Ethiopians irrespective of ethnicity or religion. Given this, fresh hope is on the horizon because recent years have seen high economic growth rates and many new sectors are starting to bloom. 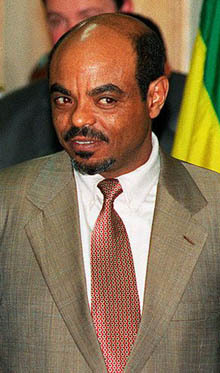 In recent weeks, Meles Zenawi hinted that he may leave office and he may or may not do so? Whatever he and the EPRDF decide, it is clear that the EPRDF is a functioning political party and Meles Zenawi, like all politicians, is replaceable despite wisely guiding Ethiopia during difficult times. After all, the EPRDF functions to serve all Ethiopian people and Meles Zenawi functions within the EPRDF. This once more shows you the democratic nature of the EPRDF and how it sole purpose is to serve the Ethiopian people under the democratic institutions which have been put into place by this political party. For many Ethiopians and EPRDF members, they are hoping that Meles Zenawi will remain in power and that he will guide the EPRDF in the next general election. However, his vision, and the vision of the EPRDF is based on developing and modernizing Ethiopia and for this reason the majority of Ethiopians supported the EPRDF during the last election. Therefore, while this issue is topical, it pales into insignificance when compared with developing Ethiopia. Therefore, Meles Zenawi and the EPRDF can be trusted to do what is best for Ethiopia. After all, the foundation stone for a prosperous Ethiopia is being firmly laid by the EPRDF and this “stone” applies to all Ethiopians, irrespective if Christian, Muslim, a follower of traditional beliefs, secular, or whatever. BoA Releases Stunning New Song "Milestone"
Turkey and The Secular Card, Myth or Reality? Lee Jay Walker serves as Tokyo Correspondent of The Seoul Times. He specializes in int'l relations and geopolitics. He is also involved in analyst work and research on business. After finishing BA degree in East European Studies at the University of London, he earned MA degree in Asia Pacific Studies at Nottingham Trent University. Website at http://www.leejaywalker.wordpress.com where work is published.